Leading 100% Export Oriented Unit of tie dye square pouf cover, hand block print floral square ottoman, hand block printed floral square pouf ottoman floor stool cover, turquoise patchwork and embroidered floral cotton pouf, round floral embroidered & patchwork cotton big pouf bench and off white and yellow floral printed cotton handmade puffs from Jaipur. Description : Inspired by the vintage artwork, our hand Block printed cotton pouf covers give different visual results. The square ottoman in a gorgeous Leaves pattern is the perfect choice for accessorizing your home decor. The invisible zippered closure gives you another reason to buy the pouf cover. As seen in, the covers are trendy, and we hope you like it just as much. 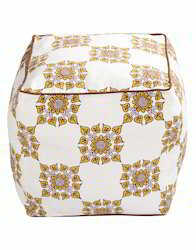 • Beautiful Ottoman made of soft cotton Pouf. 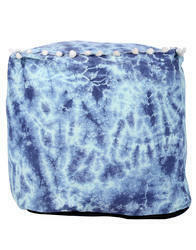 • Indian Tie Dye Pouf Bench. • Traditional Ottoman has made from experienced craftsmen. Inspired by the vintage artwork, our hand Block printed pouf Bench covers give different visual results. The cotton pouf cover in a gorgeous floral pattern is the perfect choice for accessorizing your home decor. The invisible zippered closure gives you another reason to buy the pouf cover. As seen in, the covers are trendy, and we hope you like it just as much. Beautiful Ottoman made of soft cotton cloth. Traditional Ottoman has made from experienced craftsmen. We are offering our customers an excellent quality range of square ottoman. Rajrang presents wide range of Indian designer Hand Block Printed products. We Providing You a Best Range of Hand Block Printed cotton pouf. This Beautiful Ottoman Has Made From experienced Craftsmen and Given a Ethnic Rajasthani Look. Description : We are offering our customers an excellent quality range of round ottoman. Rajrang presents wide range of indian designer patch work Embroidered products, patch work of india's experienced craftsmen. We providing you a best range of pouf bench. 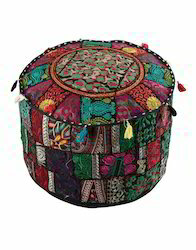 This beautiful ottoman has made from experienced craftsmen and given a ethnic rajasthani look. 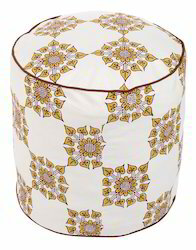 • Beautiful Ottoman made of soft cotton cloth. • Indian patch work Embroidered. Description : We are offering our customers an excellent quality range of Round Ottoman Rajrang presents wide range of Indian designer Embroidered Work products, Patch Work Embroidered Work of India's experienced craftsmen. We Providing You a Best Range of Embroidered Work Cotton Pouf. 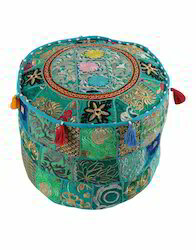 This Beautiful cotton pouf Has Made From experienced Craftsmen and Given a Ethnic Rajasthani Look. • Indian Patch Work Embroidered Work. Inspired by the vintage artwork, our hand Block printed round Ottoman covers give different visual results. 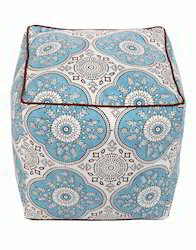 The cotton pouf cover in a gorgeous floral pattern is the perfect choice for accessorizing your home decor. The invisible zippered closure gives you another reason to buy the ottoman. Beautiful Upholtered Ottoman made of soft cotton cloth.